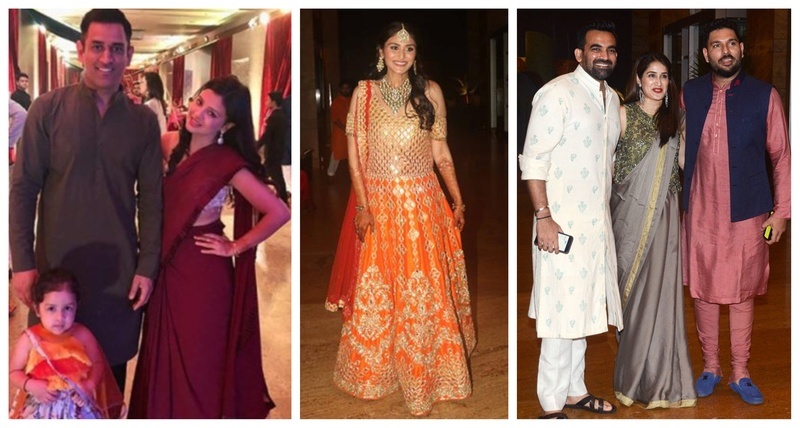 Inside Politician Praful Patel's daughter, Poorna Patel’s grand sangeet: MS Dhoni, Yuvraj Singh, Irfan Khan and Sophie Choudry in attendance! Poorna Patel,the daughter of Union Civil Aviation Minister Praful Patel and industrialist Namit Soni recently got engaged, and the pre-wedding festivities have started in full swing! The mehendi ceremony was held last night and it goes without saying that it was a star studded affair. The bride-to-be looked stunning in a jazzy outfit with a cold-shoulder cut paired with a sheer dupatta. She completed the look with layered necklace, earring and maang tikka set. The Chennai Super King cricketer looked dapper in a greyish-green high-low kurta while Sakshi looked stunning in a burgundy saree. Fhe one who stole the limelight was their daughter Ziva Dhoni looking adorable in a floral lehenga skirt paired with a yellow fringed choli. Quite a stunner that little one. Sagarika looked stunning a grey satin pre-draped saree, while Zaheer complimented her look with the placed motifs in his ivory kurta. Yuvi is looking his usual stunning self in a raw silk kurta-pajama set paired with those statement moccasins. Okay, so having a really hard time to decide, who is looking more stunning among the father-son duo. Known to never disappoint us with her fashion choices, Natasha Poonawala made a stunning entry in a sheer grey saree with multi coloured floral work on the border. Totally diggin the shimmery powder blue lehenga of Nusrat with floral embroidery on it. Now that’s a stylish brother-sister duo. Where Karan looks his dapper self his sister looks gorgeous in dhoti pants paired with an one-shoulder top. Sophie Chaudhary looks ravishing in an ivory and red lehenga skirt paired with a shimmery choli and sheer dupatta. Well well, with a sangeet night like that, we are totally looking forward to the upcoming pre-wedding festivities!